Vigor anti-fatigue mats are ergonomically designed to provide comfort and relief while standing for long periods of time. Our elastic, nodule design significantly increases blood circulation. Cumulative trauma disorders are reduced by forcing foot and leg muscles to work, even when standing still. Custom order 2' thru 6' widths, any length. 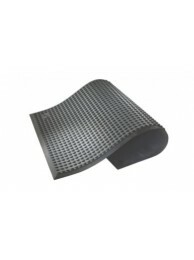 Anti-fatigue, Polyurethane Floor Mat with Low Profile Beveled Edges. Size 3' x 4' (36" X 48") Vig..
Anti-fatigue, Polyurethane Floor Mat with Low Profile Beveled Edges. Size 3' x 5' (36" X 60") Vig..